It may come as a shock to you to learn that although IRAs are recommended or all individuals, Gold IRAs in particular are not ideally suited for everyone. There are a variety of reasons for why this is the case. They mostly come down to the range of pros and cons for precious metals IRAs. 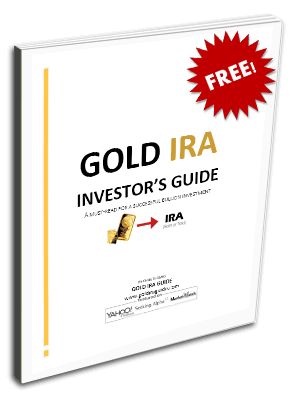 We look at some of the Gold IRA pros and cons on this page. Perhaps the most important benefit of a Gold IRA is that it provides you with the ability to sleep better. This results from the greater control you gain over your own financial future and hoped for retirement. Control is something that everyone wants and needs more of in life. The good news is that a physical gold IRA offers exactly that. You gain this control over your financial future as you on longer have to be concerned with if your money will lose value over time or not to that demon inflation. You know this with certainty thanks to the historical record of gold. The yellow metal has always kept pace with or outperformed the accepted rate of inflation over the long term. The classic example is to take a $20 gold piece from one hundred years ago. In 1917, this $20 purchased a man a high quality, personally tailored suit in London or New York City. Today in 2017, the same $20 gold piece is worth over $1,100 per ounce, and it will still buy you a high quality, bespoke tailored suit in either fashion capital. In fact, it is quite possible you will still have enough money left over after paying your tailor to go out for a nice dinner for two. People who are interested in protecting their future may argue that just obtaining the physical gold personally and keeping it yourself is a better way to safeguard your finances from inflation. The problem is that most individual simply do not realize how complicated it becomes to personally hold your gold coins physically at home. In order to keep the treasure safely at home, you need to purchase and have installed a home wall or floor safe. Otherwise, you will have to open a safe deposit box at your local bank and pay to maintain this form of storage. You may also end up paying premiums that are outrageously and unnecessarily high when you buy the gold coins yourself. These problems are solved by having a gold IRA administrator purchase them on your behalf directly from the coin dealer and by allowing the IRA approved depository to safeguard and inventory the coins for you afterwards. Most financial advisors will recommend that you keep all of your retirement assets in some combination of only stocks and bonds (or mutual funds based upon these asset classes). They may adjust the percentages, but whether they are talking about 60 percent stocks and 40 percent bonds, or 40 percent stocks and 60 percent bonds, the end result is more or less the same. You are exposed to only two asset classes which are highly correlated to one another. Gold is a highly uncorrelated alternative asset class which typically does not decline with stocks and bonds. Instead, its beta is different enough that it provides a true and powerful hedge against the main asset classes of stocks and bonds. Remember too that stocks may crash and burn even by 50 – 60 percent. Gold will never crash and burn to be worth nothing, since it is a physical asset with its own intrinsic value. You pay for health insurance, life insurance, homeowners insurance, and car insurance to protect you from unanticipated disease, premature death, fire or theft, and a car accident which is not even your fault respectively. Why would you not protect your financial future and portfolio assets against unforeseen dangers which no one can accurately predict except for to say that they will occur in the future as they have consistently in the past. Gold IRAs protect you from a whole host of financial and geopolitical dangers. Among these are consistent and historically unparalleled government spending and stratospheric debt levels, uncertainties in the market, political instability, the ravages of inflation, and even systemic or financial collapse. Name another single form of investment or asset class that can do all of these things period, much less half as well. You will not find one. We will consider these cons in greater detail as well now. You will be told that your Gold IRA holdings are stored at a particular depository. With a little persistence, you should be able to get the address, website, and phone number of the vault. This will still not get you inside the vault to examine your physical inventory. Ultimately, you will have to trust your precious metals IRA administrator and the piece of paper with which they will provide you that states you own these precious metals coins. This is why it is critical you work with a reputable and well respected IRA administrator custodian and depository company so that you do not one day find out that your administrator or depository has gone bankrupt or fled the country with your precious metals. There are some self directed IRA administrators and depositories out there who will permit you to make an appointment in advance and pay a fee to examine your physical gold holdings. If you are nervous about wanting to know conclusively where your gold is and that it is really there, this is a smart option for you. Holding a Gold IRA should be for the long term. Those investors who feel like they want a quick score on a fast move in gold prices would be better served to buy one of the major gold ETFs than to open up a fairly expensive to setup and maintain Gold IRA account. These are not accounts where you can rapidly move in and out of gold positions. The fees associated with buying and selling physical gold are high enough that you would probably fail to do so profitably on fairly small moves in any case. Many investors are fixated with dividends which stocks pay or with interest payments that bonds provide. You will never receive either of these with physically held gold in or without of a precious metals IRA. The most you can hope for in these types of retirement accounts is to gain value through capital appreciation of your holdings in the price of gold and the other precious metals. With patience, such a strategy will likely pay off for you handsomely over time.